St James' Park is an all seater stadium in Newcastle upon Tyne, England. It is the home of Newcastle United FC a Premier league club and has a seating capacity of 52,999. St James' Park has been the home of Newcastle United since 1892 and has been used for football since 1880. Throughout its history, the desire for expansion has caused conflict with local residents and the local council. This has led to proposals to move at least twice in the late 1960s, and a controversial 1995 proposed move to nearby Leazes Park. Reluctance to move has led to the distinctive lop-sided appearance of the present-day stadium's asymmetrical stands. 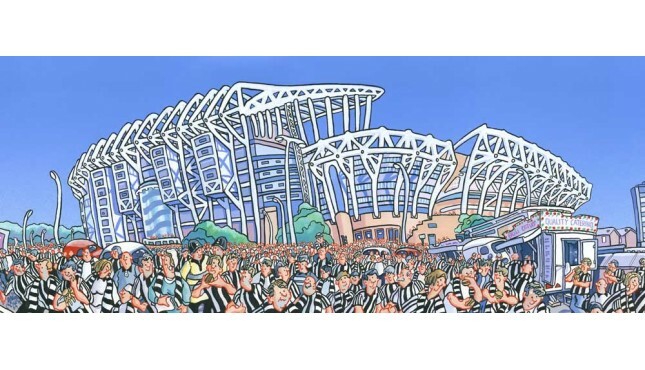 Pictures of St James' Park can be found on the site from many different artists. Besides club football, St. James' Park has also been used for International football, it was used as a football venue for the 2012 Olympics, and will also be used as a rugby venue for the 2015 Rugby World Cup. In addition to professional football, the stadium has hosted charity football events and rock concerts, and been used as a set for film and reality television. Out of the Strawberry and into the match. The strawberry public house is opposite St James's Park..
Warcry for a GeordieLimited Edition Giclée print on archival matte paper with single off-whi..
Limited Edition Giclée print on archival matte paper with single off-white mount, cellophane wrap.. Marching in hope & gloryLimited Edition Giclée print on archival matte paper with single..